Though Gmail provides you with lots of default themes to choose from, you can customize your Gmail account by creating a personalized theme. There are also other enhancements which you can do to your account. Login to your Gmail account. Then, click the Gear option located at the top-right and select Themes. Alternatively, you can go to Themes option by clicking on Settings located in the Gear option and then select Set Theme by navigating to the Themes menu. After you have selected the Themes option, you will be presented with a set of default themes to choose from. To create a Custom Theme, you need to select My Photos option present in the bottom-right of the window. Select the image which you want to keep as a theme. If the image you are looking for is not present in your Photos, you can upload the image you want and then select it (Gmail recommends an image larger than 2560 x 1920 pixels). After you finish this step, your image will be added to the Themes section. After you have selected your image, you can add some enhancements to it. At present, there are three options to try, present in the bottom of the Themes window. You can select either Light or Dark text background from the Text Background. You can add Vignette by adjusting the slider present in the Vignette option. You can adjust the blur of the background image by adjusting the slider present in the Blur option. After you have personalized your theme, click Save. That’s it! Your Custom Theme is ready. You can share your theme with your friends by clicking on Share your theme located in the Gear option. 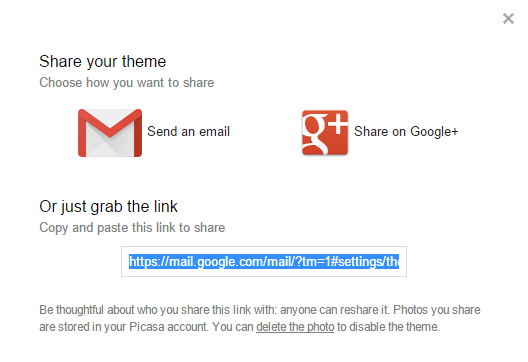 You can share through email, Google+ or by copying and pasting the link. When your friends click the link you’ve shared with them, a confirmation pop-up will appear. If they click Okay, their theme will change to your Custom Theme. 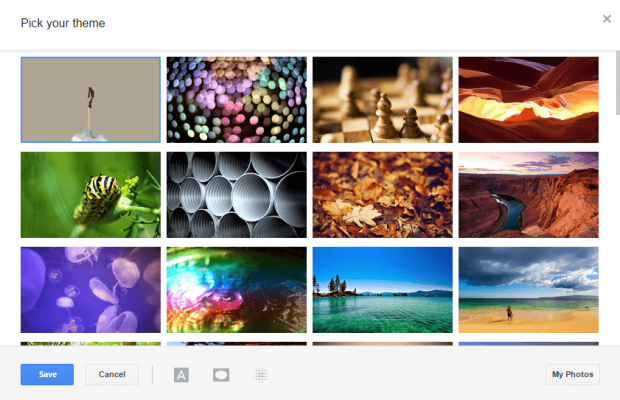 You can disable your Custom Theme by deleting the image in Picasa Web Albums or by selecting another Theme.